Dr. Rebecca Timlin-Scalera of Fairfield points out a participant in a charity ice cream event in Fairfield Friday that raised money for breast cancer research. FAIRFIELD, Conn. — Fairfield students celebrated the last day of school with ice cream, but it was all done to help fund research into metastatic cancer. The Saugatuck Sweets Scoops Challenge fundraiser saw teams of schoolchildren race to eat as much ice cream as they could in five minutes. 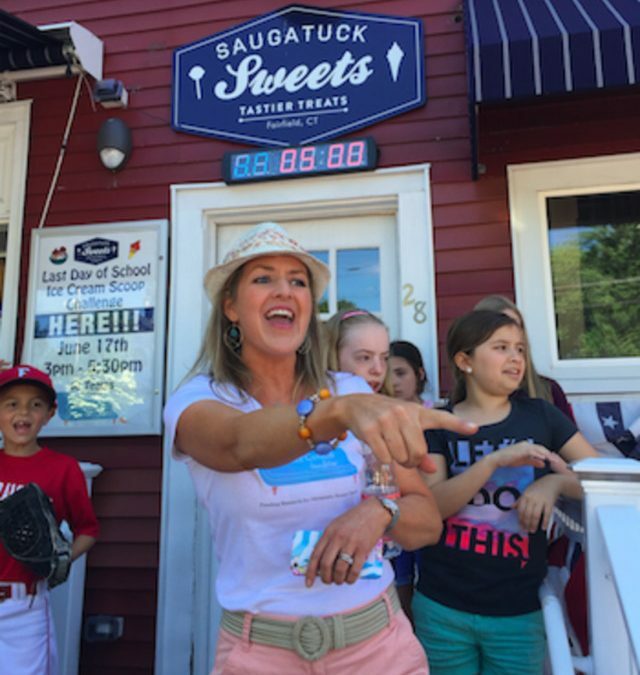 The event was held in front of the Saugatuck Sweets’ Fairfield location on Reef Road. "I thought this would be a great way to kick off summer, it’s the last day of school in Fairfield, and we thought let’s have an ice cream contest," said neuropsychologist Dr. Rebecca Timlin-Scalera of Fairfield who organized the event. Metastatic breast cancer is the most deadly form of the disease, and 30 percent of people diagnosed with early stage breast cancer eventually develop MBC, she said. She also blogs at thecancercouch.com/ from the perspective of a psychologist turned patient with advice on how to cope through adversity by finding humor and gratitude in ordinary moments. The foundation’s goal is to fund research projects for metastatic breast cancer at Memorial Sloan Kettering Cancer Center and The Dana Farber Cancer Institute, with the potential for making this a chronic, but managed, condition rather than a terminal illness. More than $60,000 has been raised in seven weeks for The Cancer Couch Foundation. The students involved in the ice cream challenge had to form teams that needed to raise at least $200 in order to compete. The initial goal was $6,400 but the teams of students relentlessly fundraised and the total reached nearly $20,000 by Friday. Among the keen fundraisers was James Cunningham, Timlin-Scalera’s nephew who raised almost $2,500 by going door-to-door in his neighborhood. Al DiGuido, owner of Saugatuck Sweet Shop who donated ice cream for the event, said he got involved after speaking with Timlin-Scalera and hearing her story. "It allowed kids to have a lot of fun and contribute back to the charity," said DiGuido who has his own charity, Al’s Angels. Its mission is to provide moments of joy and comfort to families that are challenged by childhood cancer, rare blood diseases, AIDS, domestic violence and financial hardship.